I was prepared, mostly. Life happened, as it does, interrupting a couple important peak weeks of training, but I had started preparing early enough and I still believed I could finish the marathon around 4hrs ( the arbitrary goal I set for myself ). As I finished my last couple weeks of training I felt as though I logged an acceptable amount of miles for my first go around. I even did that tapering thing the way an internet training program said I should. Other than an infected ingrown toenail in my right big toe, which I decided to have removed after the marathon, all seemed well. Within two days of the marathon all I needed to focus on was getting there safely, eating well, and sleeping soundly the night before the race began…at 6am on a Saturday morning. Those three things should have been fairly easy. I was hitchhiking to Swakopmund the day before the race started. After spending a year and a half in Namibia serving as a Peace Corps volunteer I had become quite accustomed to hitchhiking and was not concerned about the travel. The accommodation was already arranged; Alex and I were staying with a nice Namibian family that we had met on a previous adventure, so sleep wasn’t an issue. And as far as eating well was concerned, Swakopmund, being a tourist destination and a larger Namibian town, provided all the healthy food options I needed. Basically, I had it all covered. I mean, packet pickups were even coordinated for us. All was pretty perfect, right? Come on. Those of you who know me know that things couldn’t work out that smoothly. It’s me we’re talking about, me, always wading through the karmic slop that I must have built up in a previous life. Thursday: Two days before the marathon. I had to leave my village two days before the marathon in order to get to Swakop a day before the race started. The plan was to meet up with Alex in Khorixas, much closer to the race location, then we would hitchhike the rest of the way on Friday. I usually expected it to take between seven and eight hours to get to Khorixas from Mpungu. I had my bags packed the night before, a feat for me in and of itself, and was on the side of the road looking for a ride towards Otjiwarongo by 7am. I waited for a little more than an hour when a gentleman driving a new BMW pulled over and said he was heading to Windhoek and could take me straight to Ott. Amazing! I never get straight hikes from my village to Ott, and definitely never in a car like that. I was always in some run-down bakkie, that despite being in the middle of nowhere, found more and more people to pick up and cram into every tiny space in the bed of the truck, that stopped every 50km to drop off this or that or pick things up, like chickens, goats, and car transmissions. Said bakkie usually only went as far as Tsintsabis where I then had to taxi to Tsumeb where I would look for another lift to Ott, from where I’d have to get another lift to Khorixas. But this time, I was in a sweet ride with air-conditioning for about 370km going straight to Ott. Things were going to be great, so I thought, so naively. From my village to Tsumeb the trip was smooth, but that’s about where it ended. In Tsumeb, my driver decided he wanted to find some people traveling to Windhoek so he could make a little extra gas money. We stopped at the Trek filling station to inform a guy we were looking for customers. This guy was to approach anyone and everyone walking near the filling station to find out if they were traveling to Windhoek, and he would be rewarded with ten dollars for every customer he obtained. At that point, I started to worry a bit, but not too much, because there was a chance we’d get a couple of customers quickly and be on our way in less than thirty minutes, which would still mean I was making great time. There I went again being hopeful. Next thing we did was pull out of the filling station to go to a carwash. This guy was driving the cleanest car inside and out that I’d ever been in, but still it needed that extra shine. I mean, he was about to drive into Windhoek, and you gotta be shining when you roll into the capital city, right? After about an hour at the car wash we went back to the filling station to find zero customers waiting for us. After another hour waiting at the station the driver who picked me up finally said to me “maybe I am delaying you?” Uh, do you think so? Deciding it would be better if I tried to find a different ride, I asked him to drop me off further up the road at an intersection where I could usually get passersby to pull over and pick me up. From there I waited in the hot sun for about thirty minutes before a passenger kombi (big van) offered me a ride, exactly the kind of ride I didn’t want. Being desperate though, I crammed myself in the already overcrowded balmy van in between two rather large memes (pronounced: may-mays, meaning adult women) and, although very annoyed, at least I was on my way. As frustrating as traveling was in Namibia, there was usually something that happened along the way, something that didn’t quite make things all better, but gave me at least a reason to laugh. In this kombi the meme to my left was trying to carefully open a partially frozen bottle of flavored sparkling water. It was proving to be a challenge for her as every time she loosened the cap there seemed to be an endless amount of pressure ready to spray the inside of the kombi with high quality grapefruit flavored H2O. Growing impatient, this woman came up with a phenomenal idea. She would put the bottle in her mouth, and use her teeth to open the cap, that way when all that good water came rushing out, it would just go directly into her mouth. Problem solved, what could go wrong? Of course, I am sitting there watching all of this go down trying not to laugh that a woman riding public transportation is about to fellate a plastic bottle hoping the end result is fluid bursting into her mouth. It’s juvenile I know, but in my defense the older woman to my right was looking over and shaking her head in disapproval, so I wasn’t the only one making that connection, and you know you would watch in anticipation for that plan to literally blow up in her face. And it did. As soon as she loosened the cap, carbonated water burst out from the cap and the corners of her mouth, dousing her face with water. She started coughing and choking, as she most likely had water shoot straight up into her nasal cavity. My pants were an innocent bystander from this little operation, but me and my pants agree, it was totally worth it. Other than my sweaty skin being pressed against the sweaty skin of two others for an hour and a half and a little sparkling water on my pants, getting to Otjiwarongo wasn’t too bad. In Ott, I decided to find a taxi that drove back and forth between there and Khorixas daily. I knew I’d have to wait for him to fill his car with customers, but it was only about noon at this point, so I was willing to wait an hour or two for that to happen. That hour or two turned into nearly five hours! At this point, I was just beaten down. In that weird state of being really irritated and somehow apathetic at the same time. By the time I finally got to Khorixas, my trip totaled a little more than twelve hours, and there were only about thirty six hours until the marathon. But I was happy to be off the road, Alex had a nice dinner ready for me, and I figured a good sleep would knock off any residue from that awful trip. The next morning we got out to the hike point for Skakopmund early and I was very hopeful. Alex always got the best rides while hitchhiking. It was like people with really nice cars would see Alex and say to themselves, I just really want to make sure that girls gets to where she is going safely. It was early, I was with her, things were going to be fine. Three hours later, we were still sitting there on the side of the gravel road with no shade and it was getting hot. I guess the hiking gods hated me more than they loved Alex. While we were waiting for a ride I stepped on an elephant thorn that went through the footbed of my sandal and pierced the ball of my right foot. Having a sandal nailed to my foot with an elephant thorn did not feel good at all, and not what I wanted to have happen to me less than twenty four hours before running my first marathon. I pulled the thorn out of my foot easily enough, but needed to use my Leatherman to get it out of my sandal. Shortly after my self administered foot surgery, a bakkie pulled up, and although it wasn’t the ideal ride we had no choice but to accept it. We were jammed in the back of this pick-up truck with about five other people and large sacks of frozen (thawing) meat, and would be for about five hours if we were lucky. Spoiler alert; we weren’t. The guy driving made multiple stops at seemingly random locations along the way, extending the duration of our trip by at least an hour. At one point he stopped and loaded a bunch of drought relief maize meal into the back of the already crowded bakkie, and later when he tried to jam two more passengers in, we all resolutely protested, winning that battle. When other Namibians are saying “NO MORE” then you know it’s gotten bad. 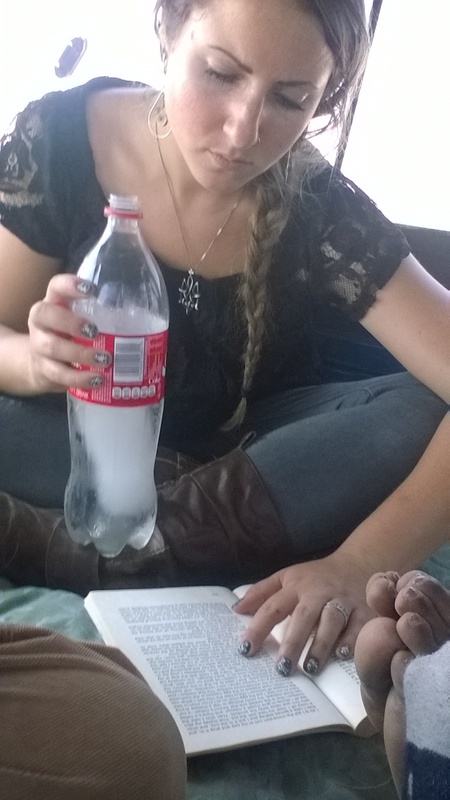 Featured in this photo from the bakkie ride to Swakopmund are Alex, two pairs of strangers’ feet, and my knee cap. Alex: No, you picked us up 10k outside of Khorixas and are dropping us off outside of town, and you overcrowded us and made multiple stops. Take 140. Alex: Well, you’re not a nice person. Driver: Fine, I will not pick you up next time. Alex: There won’t be a next time. Meanwhile, I was noticing a sharp pain in my foot and was trying to determine if I still had a piece of that thorn in there. After the exchange and we paid our N$140, we took a taxi into town and met up with some friends at a nice little cafe. While we were doing so, we were trying to contact the family we were supposed to be staying with that night. Halfway through the dinner we still hadn’t heard back from them. Suspicious, we thought. We had just confirmed a couple days prior and were told everything was fine. After dinner, still nothing. We decided we should wait another hour or two after dinner to hear from our hosts, so we joined a couple friends at a craft beer house to have a much needed drink and pray that we weren’t about to get stood up. On the way to the beer house, it was determined there was definitely still a piece of elephant thorn in my foot, as I could barely put any weight on it. So while we were trying to relax and have a beer, my friend Mariah, after failing with my pocket knife, went next door to a hotel and borrowed a safety pin to try remove the thorn from my foot. It turned out to be quite the challenge, and at one point there were five waitresses from the beer house taking turns jabbing a needle into my foot to remove this thorn, until finally a Nama woman came over and popped that thing out in about ten seconds. I was quite relieved to have the thorn out of my foot, but unfortunately that “nice” family that we were supposed to stay with did indeed stand us up, with no explanation, so we had to call around to a bunch of backpackers and hostels looking for a place to sleep. We made it to a backpackers around midnight, and, as quietly as possible, I crawled onto one of the available top bunks, fully clothed, and slept for about two hours. At 6am on October 1, 2016 I started my first marathon, sleep deprived, with an infected ingrown toenail, a hole in my foot from an elephant thorn, and after two days of some of the worst traveling experiences of my life. I was almost ran over by two cars during the run and am proud to say I finished that marathon at about 20 seconds over the four hour mark. All in all, I’d call it a success. 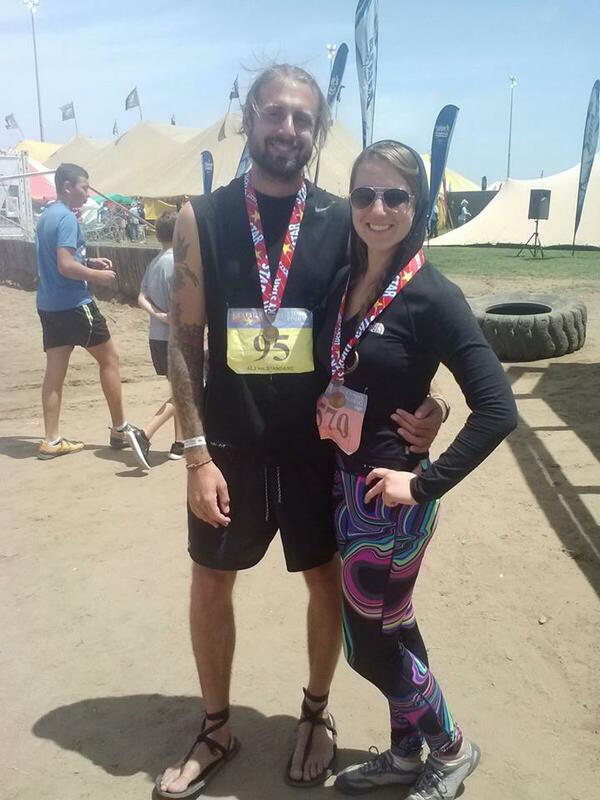 Oh and yes, I did run the marathon in the sandals you seen in the photo. Super Alex! super writing, super grit. Namibia turned your corner. Are you in West Chester? Would love to see you at some point. Thanks Virginia. I always appreciate your feedback and encouragement. Would love to see you as well. I’m in West Chester again so maybe I can come to the bookstore again soon.